Sometimes simple is best. I have had green bean casseroles, stir fries and beans in sauce. 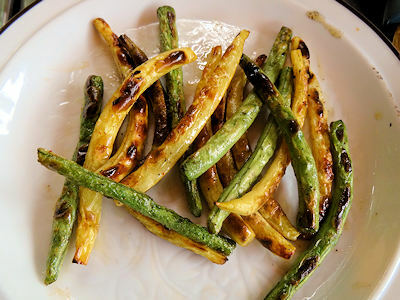 Nothing quite measures up to grilled green beans. The beans sweeten a bit as they char and the flavour intensifies. I decided to add a bit of heat and Berbere Green beans were born. I mixed together some olive oil, cider vinegar and Berbere spice. You could substitute ground dried chipotle or chili powder. I heated my Weber Genesis grill to high heat. You can also use a heavy fry pan over medium high heat but it really turns out better on a grill. I tossed the green beans in the oil mixture and put them on the grill. It only takes a couple of minutes to get a touch of char on the beans. Brush them with the oil mixture and turn them to char on the other side. These are great! The beans are crisp but tender, they have a nice touch of heat that goes so well with the sweetness the char brings out. You have to try these. Mix the oil, vinegar, and spice. Toss the beans in the oil and put them on the grill until it just gets char marks. Brush the beans with the oil mixture and flip to get char marks on the other side. These sound so tasty! I’ll have to give this recipe a try! Thanks, Kris. It is our favourite way of serving beans.